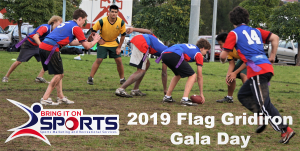 Bring it on Sports are seeking expressions of interest for the 2019 Flag Gridiron Gala Day. The event will be a 5 on 5 tournament with division for both boys and girls. It will be open to all high schools in the Sydney area during Term 3 and 4. Playing Flag Gridiron offers students the opportunity to develop their physical, mental and social skills as well as their discipline. In addition, it will enable you to introduce a new sport to the school and provide variety to students. If you are interested in finding out more about the 2019 Flag Gridiron Gala Day please register your interest on the form below.